Early Childhood Child and Partner Transitions among Families Experiencing Homelessness Adolescent Well-Being after Experiencing Family Homelessness In the Running for Successful Outcomes: Exploring the evidence for Thresholds of School Readiness Technical Report Child Care Quality: Does It Matter and Does It Need to be Improved? New analysis of data from HUD's Family Options Study shows that twenty months after staying in an emergency shelter with their families, young children scored worse in pre-reading skills and had higher rates of overall behavior problems and early development delays compared to national norms for children their age. However, they displayed only small disadvantages in pre-math skills, and for some types of behavioral challenges their rates were similar to national norms. 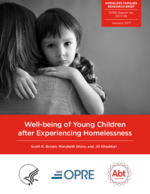 Unstable housing arrangements remained common during the 20 months following a stay in emergency shelter, with children who had more stable recent living situations and more stable child care arrangements displaying fewer behavior problems 20 months after a shelter stay than those who did not. In addition, enrollment in early education and center-based care was lower for families who had experienced housing instability in the past six months compared to those who had been stably re-housed. However, housing instability did not appear to be associated with lower enrollment in Head Start programs. Moreover, children ages three and four who were enrolled in Head Start or other early education and center-based care displayed stronger pre-math and pre-reading skills than those who were only in parental care.